8 years ago this week I fell at work while waiting tables onto a cement floor. Glass cut through the center of my right hand cutting through my median nerve, an artery, and ligaments. It blew up. I went to the emergency room. 8 years ago this week I had micro-surgery to repair those severe damages. In the following January, the bandages came off and I started occupational therapy three times a week. On the first day, I couldn't move my hand or fingers. I cried. I knew I was at the bottom of a steep painful hill. Scratch that, mountain. 7 years ago I finished OT. It was one of the most physically painful experiences of my life. I was determined to get the use of my hand back and I did. For most of that year, I couldn't work. I couldn't write, I couldn't do all of the things you take for granted. I went without make-up as I couldn't even open a tube of mascara. I did, however, learn to crack an egg with one hand. I signed my rent checks with my left hand. I learned how to adapt. I was on worker's comp and for a waitress, that means next to nothing. Somehow, I was protected by the universe money wise which was good, because I didn't have health insurance. There wasn't anything in my account, but I got through it. I wasn't done after the OT. I then had to get my strength back. I was back at work, at a new career in retail management. One with health insurance and all the benefits my scared being really felt like she needed. First I had to strengthen my wrist. I patted myself on the back when I graduated to wrist curls with soup cans. I couldn't open big New York City building doors. I couldn't push through full body subway turn-styles. I couldn't do yoga. 4 years ago I was back on my mat. I signed up with a yoga studio near my work in Union Square. Level 1 beginners. From there, I began to draw a connection with my OT and a yoga practice. You have to keep doing your exercises. A little bit often can do so much more than a lot once in a while. My accident forced me to stop. It forced my busy, work-a-holic life to stop. By doing so I was able to live in the here and now. Yes, I was working on a future where my right hand and my old self would be back in action, but I had to figure out how to deal with just one hand for now. I had to be determined with no knowledge of what the outcome would be. The therapists and doctors gave me nothing in terms of hope. In fact on my last day in therapy they cheered me on as they admitted that they thought my hand would be a permanent hook shape forever. They couldn't believe my hand straightened out. Apparently, I cut through what they call the "dead's man land" of your inner palm. Not something you want to do. In yoga and in life we don't know the outcome. We practice to let go of the expectations. This is one of the many things yoga teaches us. Through that we can find gratefulness, even when in pain. Through that we can manage the pain. My outcome could have been what the therapists were ready to bet money on. I still do my hand exercises when I'm on the subway or just sitting around. It is now second nature. I'm still not at the strength I was pre-accident. Not sure if I ever will be. Maybe I will. I don't put those expectations on my practice though. 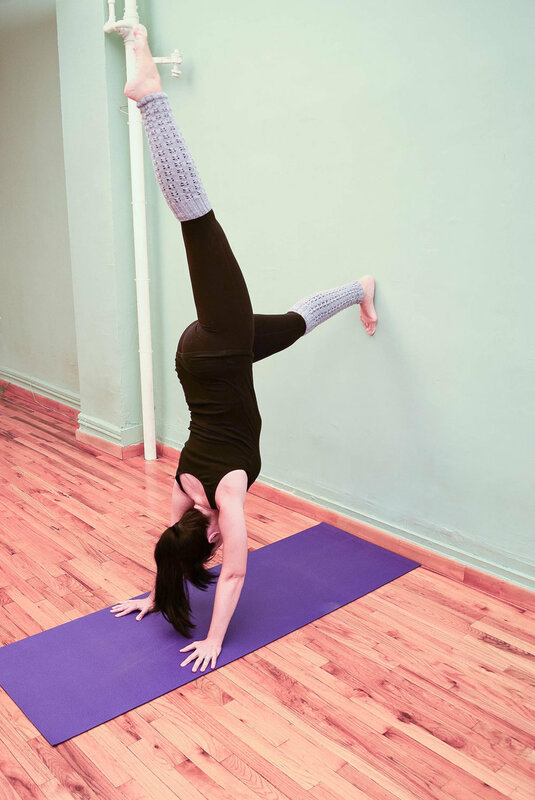 Yoga is not about the handstand. What I can or can not do will change tomorrow and be different from the day after that. It's about the practice with no knowledge or expectation of the outcome. From there, the outcome just appears. The outcome being the realization of one's true nature. Some days I can do this. Some days I can't. I always keep trying. As we enter the season of giving thanks, take time to think about or write down what you are grateful for. You can do it daily or once in a while. But the more you do, the more you gain. Lazy mornings with my husband and cat, Coco. If I don't see you at the last Morning Glow class of 2017 this week, have a happy Thanksgiving!